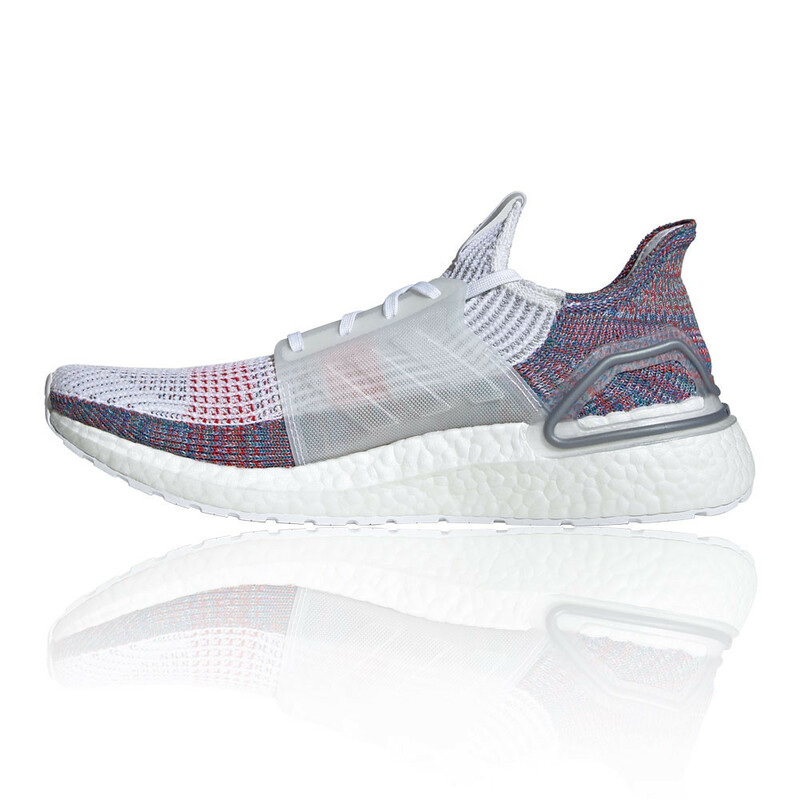 In this new and updated version of the Ultra Boost, adidas has collaborated with thousands of runners for over almost three years to co-create this game-changing running shoe. By streamlining the ultra-boost from 17 components to four performance-driven pieces of greatness, the ultra boost 19 will fly to the top of everyone's running kit list. In this new and updated version of the Ultra Boost, adidas has collaborated with thousands of runners for over almost three years to co-create this game-changing running shoe. By streamlining the Ultra Boost from 17 components to four performance-driven pieces of greatness, the ultra boost 19 will fly to the top of everyone's running kit list. The four performance-driven components are a new torsion spring, optimised boost technology, new primeknit 360 upper and lastly, a new updated heel frame. Running has changed - there's now a young, inclusive, fun side to the sport. 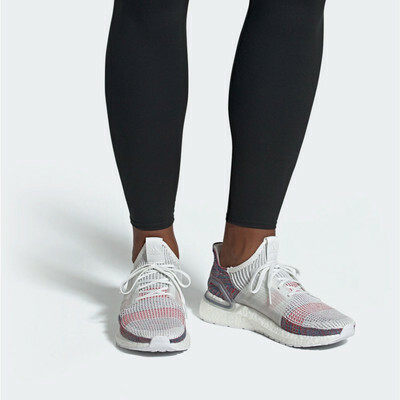 adidas call this 'new running' which is about having an open outlook, using creativity to fuel your run and embracing whatever might come your way. 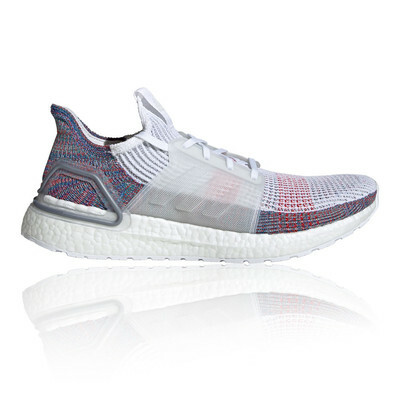 The Ultra Boost 19 is the ultimate performance running shoe, combining an optimised boost midsole and torsion spring technology to give the runner more energy return than ever before. Take a look inside this new innovation and see for yourself why this running shoe will Boost your performances. 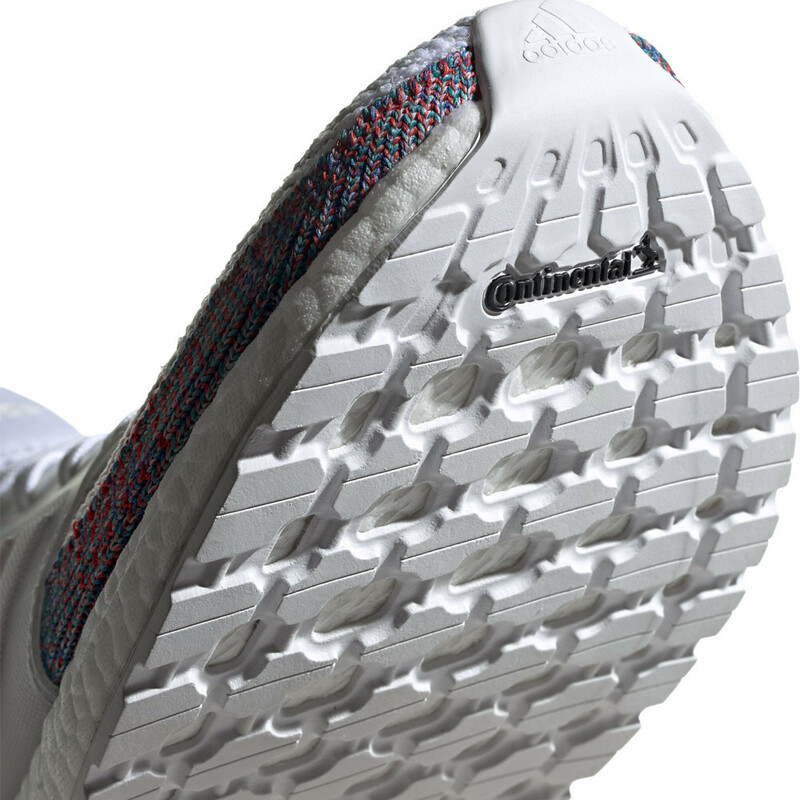 A new and updated Primeknit 360 upper will encase each foot in breathable comfort. Feeling like a second skin, its seamless construction surrounds the foot in a fused yarn that combines pure comfort with lightweight performance. Designed with motion in mind, the Primeknit 360 adapts to the changing shape of your foot through the gait cycle, the breathable, sock-like design is engineered to provide enhanced support and increase comfort to areas of the foot that require it most. The Ultra Boost 19 has kept the supportive cage that many runners loved in its predecessor, securing the midfoot and reducing in-shoe slippage for a smooth, distraction-free ride. Lastly, the upper boasts a 3D heel frame, another update, which offers the perfect mix of adaptability and support. Built from a combination of flexible and supportive materials, the stripped back design cradles the heel on impact to inject more confidence into your run. 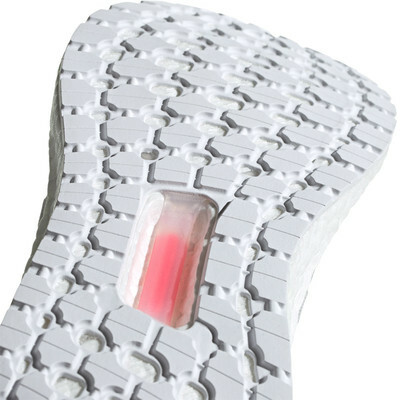 this new construction allows optimal movement of the Achilles and surrounding soft tissue while still providing support. adidas again take cushioning and responsiveness to new heights, with their ultra-responsive midsole. As many know now, Boost is constructed from tiny TPU capsules that are moulded together to form a platform that is different to standard, solid foams; absorbing energy and then expelling it back out for a bounce-like effect. This energy return technology reduces the use of superfluous muscle power, diminishing fatigue and enhancing performance; keeping you going for longer. Capturing the energy you put into running and blasting it right back out, the newly optimised Boost midsole brings even more energy return to your ride. What makes this boost arguably better than other midsole compounds is that adidas has made the boost firmer to deliver 20% more responsiveness and cushioning compared to the original Ultra Boost. 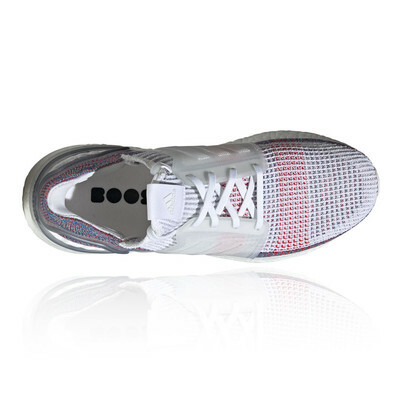 Boost also manages to maintain its special function and bounce in conditions as low as -20 degrees, making it a reliable, durable and hard to beat midsole. Furthermore, the midsole features a new tuned torsion spring that offers enhanced support on landing and a snappy transition as you surge ahead. The reason is simple: a running shoe shouldn't get in your way; it should propel you forwards. Both of these unique technologies work in tandem to push you ahead of the competition as well as giving you a good basis to break PB's. Manufactured from Continental rubber, the StretchWeb outsole completes the Ultra Boost 19 for superior grip and a smooth transition through the gait cycle. Its web-like structure cooperates with Boost to allow the shoe to stretch, for a flexible and lightweight underfoot feel. The web pattern also means a large surface area which also means better grip. Inspired by tyre technology, continental rubber supplies traction on wet and dry surfaces, giving you no excuse not to get out and run. 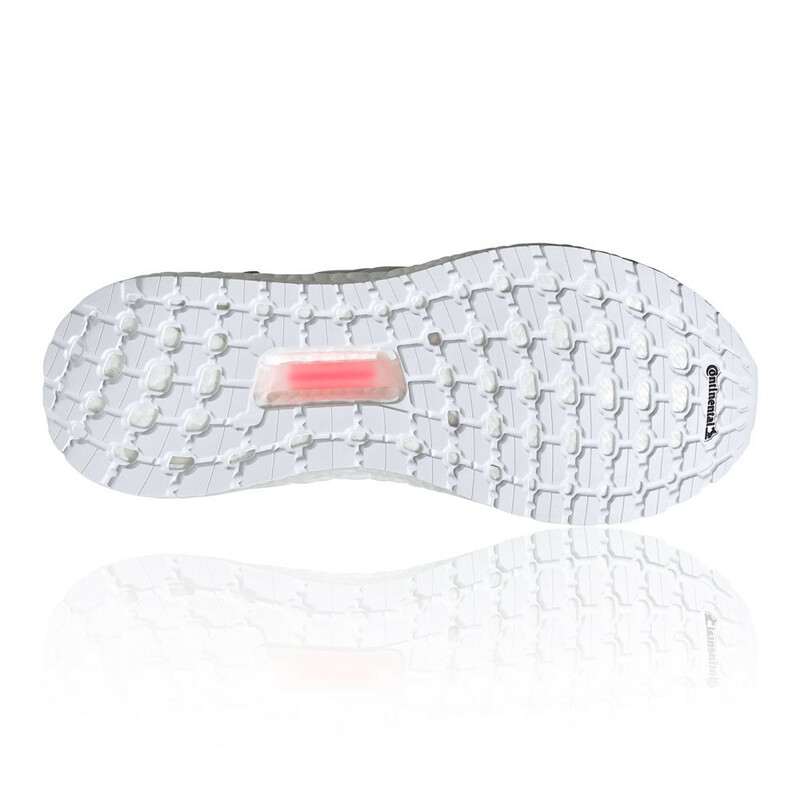 The outsole is designed to be just as durable as the Boost midsole, leaving you with a resilient, cushioned and grippy running shoe. New and Updated Primeknit 360 - Wraps the foot in adaptive support and ultralight comfort. Supportive Cage - Locks down the midfoot for reduced in-shoe slippage. Updated 3D Heel Frame - Offers the perfect mix of adaptability and support. 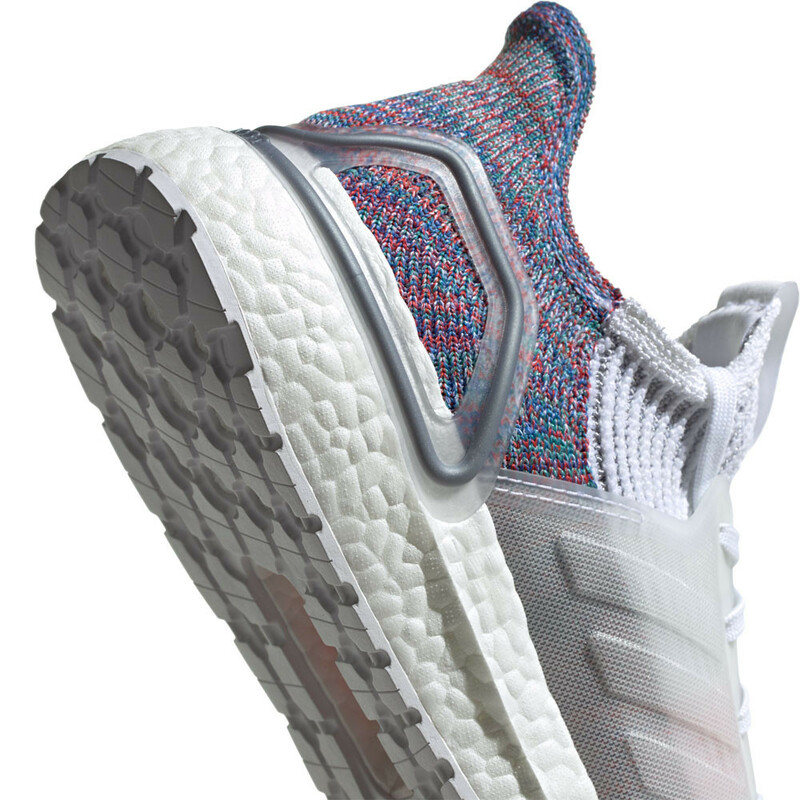 New Optimised Boost Midsole - Delivers 20% more responsiveness and cushioning compared to the original Ultra Boost. New Tuned Torsion Spring - Provides enhances support on landing and a snappy transition. StretchWeb Rubber Outsole - Constructed from Continental rubber the StretchWeb flexes underfoot for an energised ride.